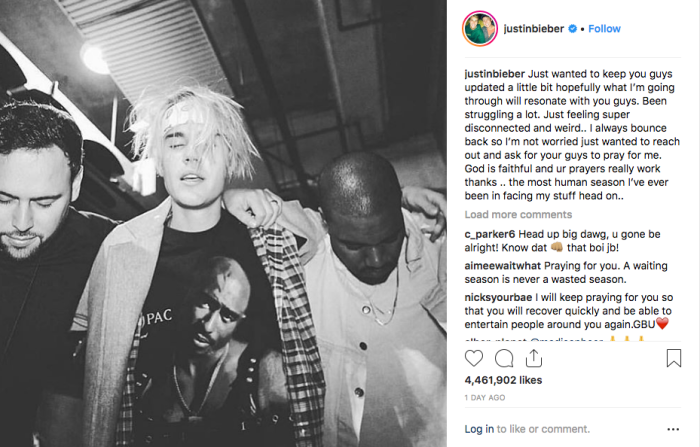 The 25-year-old pop star wrote on Instagram Sunday that he's "just feeling super disconnected and weird" and that this is "the most human season I've ever been in facing my stuff head on." "I always bounce back so I'm not worried just wanted to reach out and ask for your guys to pray for me. God is faithful and ur prayers really work thanks," he wrote. In the comment section, several pastors voiced their support and love for the pop star, including Zoe Church pastor Chad Veach, Hillsong NYC pastor Carl Lentz, and Vous Church pastor Rich Wilkerson Junior.